I am not a professional photographer. I love taking pictures of various subjects for fun or for the enhancement of my various blog sites. Lately I keep on taking pictures of our city's improvement on infrastructure, business progress in terms of newly created business ventures. But it is a common practice that I take pictures of my family activities for posterity purpose. Anyway, late this afternoon something special had happened and I captured it with my cellphone camera. I couldn't believe that it has something for me, a special message for that matter I suppose. I need to commune with the Lord on how to interpret it for I don't have the spirit of discernment. I remember 6 years ago I had written about the second coming of the Lord as predicted by a noted psychic. There is a related story below about this person for your reference. 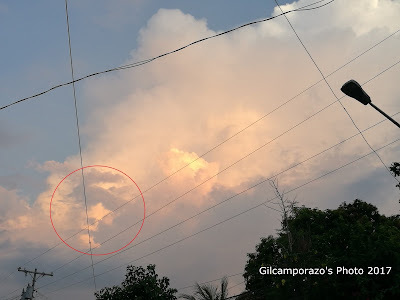 At six in the evening while I was sitting outside our home I happened to glance to a beautiful clouds' formation as the sun gradually sets. I got my cellphone to capture said sights. I was in a hurry not to miss that wonderful clouds formation. 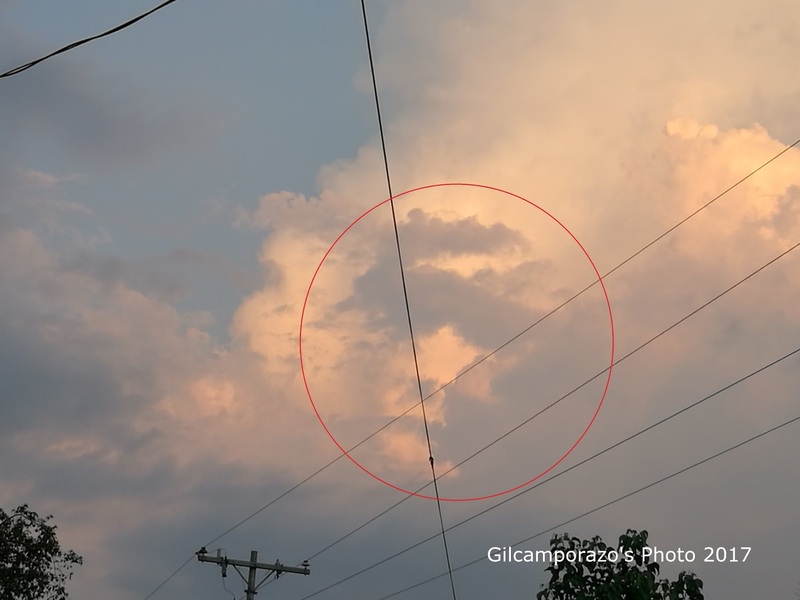 As I aimed my cp's camera to the clouds, I was surprised to see a human's head figure. I didn't click first. 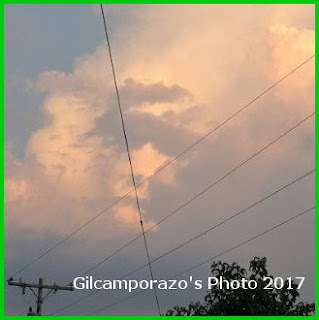 I viewed the clouds with my bare eyes but I saw nothing except the clouds in various formation. I aimed for the second time I still saw the figure. I clicked the cp. And this was what I got (The figure is in red circle for emphasis). This incidence seeing a figure formation in the clouds is the third time already. 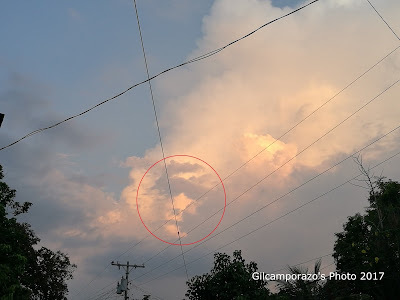 The latest was an angel figure which I saw and captured by my cp when I was heading to my last school of assignment, Balabag Elementary School. 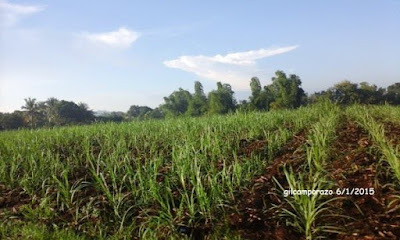 It was early in the morning while I was riding in tandem with my male teacher's motorcycle. And this was what I got. The first time that I saw another figure of temple of God, the Salt Lake Temple so to speak in the clouds while I was joining with the other members of the Church going to Cebu for a temple excursion. 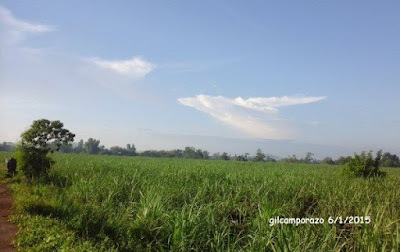 As we approached the wharf of Toledo City part ten in the morning, I saw clearly the Temple on top of the white clouds. I rubbed my eyes for it might be a mirage. The temple was still there. I even informed one male member who is sitting beside me and I pinpointed to him the exact location of the temple's figure. I received no good reaction from him as if he didn't see anything. I even explained to him the structure of the edifice, the spire and everything. He just shrugged his shoulder. Sorry, I wasn't able to capture it with my cellphone camera. But it was true and I had seen by my two bare eyes the temple. 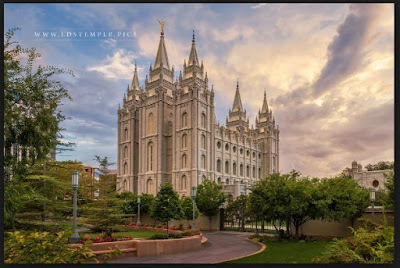 I just grabbed the Salt Lake Temple pictured by Phill Monson from his blog for presentation. Whatever the purpose of this spiritual appearances right in my very eyes, I entrust the Lord for that. I know He has something for me to do. I let the Lord's will for this. I know all these things are spiritual manifestations that God does exist and I know it. I know the Lord is coming. It is nigh at hand. It's amazing how we can see different cloud formation. And I think God can speak to us in this particular way, too. I hope you receive the message that God wishes to impart to you. I know God has something for me to do and I would be expecting it. I am just around and always ready to serve Him. 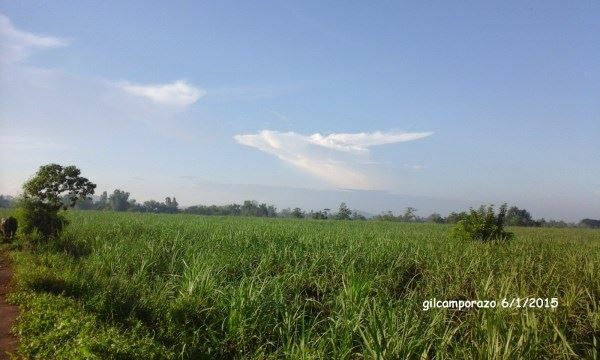 It's great that you were able to capture those cloud formations. Maybe God is telling you that He's with you (us) everywhere we go. Or I don't know maybe a deeper message than that. Very cool cloud formations. They could be a sign of something. I hope that whatever they're for that you will be able to find out what they are soon, in God's perfect time. Wow Sir this is great. I didn't see His face right away but when I take a look closer, I saw Jesus' face. You are so lucky to witness such and for sure you will soon receive the message from Him. That's an intriguing cloud formation. You must be feeling blessed during that day you took a photo of it. Great capture on the face and the angel. You must be really be watched by angels and I'm sure blessed too. i feel spirituality stimulated by this! Wow! Those are really awesome cloud transformations. I believe it is indeed some kind of a sign for you Sir Gil!